The question of how to start right - or start strong, as people sometimes put it - is one that worries many presenters. They often think that it’s all about having the killer opening line or perfecting an assertive and commanding power stance (!). But I always tell them that starting right actually goes back to the start of that day, to the moment you leave your house in the morning. If you are on your way to an important talk, you want to start developing from the moment you close your front door a more than usually heightened awareness of what’s around you. Start paying attention to your journey from that first moment all the way up to your arrival at the destination. Once you are there, keep listening and observing. Make a point of shaking people’s hands, introducing yourself and paying attention to the things people say to you. Absorb it all. 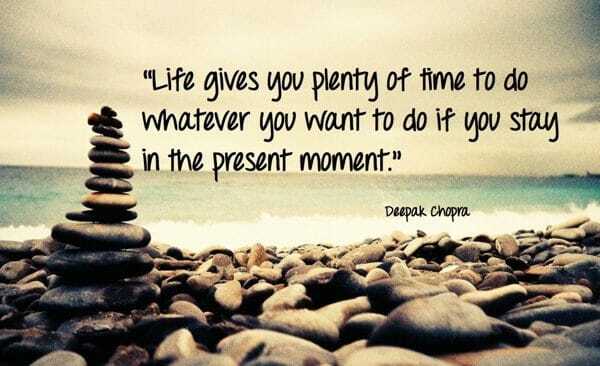 I say all this because it’s a way of being more in the moment, being more present when you come to present. Most of our nerves and fears are about things that might go wrong in a future that may never happen, or about things we don’t want to happen again, from a past that is gone from us and we can do nothing about. So the more we are in the present moment, the less we are in the past or the future - and the less we can be anxious or fearful. If you work at developing that awareness in the hours leading up to your presentation, I guarantee you that the right way to start will come to you just when you need it. And it will be something not about you, but about your audience. Anything you see could be used to bring your audience to an understanding that your focus is on them and now and not your content. Once I gave a talk at the offices of an arts organisation where you walk past some wonderful paintings to get to the lecture theatre. Looking at all these pictures, I saw how much passion the organisation had for art, and how the pictures showed a pride in their heritage and the way they work. Leading on this thought established a strong connection and the talk took off from there. It might be the view, it might be the location, be a chance remark you overheard. It might be how this event reminds you of another one. You might say something about how excited you are to be there, or how wonderful it is that everyone has managed to gather together. But ideally you want to say something uplifting and positive and non-trivial - try not to major on the lift that doesn’t work or the roadworks on the M25. Above all, it should be something that has nothing to do with what you’re going to say. Doing this shows your audience that you are a human too. It creates a moment for you all to acknowledge the shared space that you are in, and to create a connection that’s beyond the slidedeck and the handouts and the mere content. It gives you and your audience time to respectfully acknowledge one another, to come into each other’s presence, to mesh and understand each other’s familiar humanity. Trust is vital here. Trust that you will find something to say, trust that your start with resonate with your audience. But it will - trust me. It has to, because we are all human and there are so many connections just waiting to be made. So the best start is not something you plan. Things often just find a place, if you allow them to find a place. It’s what comes out at that moment, unforced and unsolicited. Embrace the thought that comes to you, and in so doing you embrace your audience. The most watched TED Talk of all time is called 'Do schools kill creativity?'. It’s by Sir Ken Robinson. The start is instructive: "Good morning. How are you? It's been great hasn't it? I've been blown away by the whole thing. In fact, I'm leaving…"
There is so much going on here. That simple greeting and question is a wonderfully down-to-earth way of checking in with the audience. You feel he means it too. Sir Ken says nothing about his own talk, but talks instead about how inspiring all the other talks have been, referring to a shared experience he and the audience have all had and can feel grateful to be a part of. And a touch of self-deprecating humour - delivered with great timing - make you want to warm to him further and want to hear more. All this is obvious when you see it, but let’s be honest: often when we are speaking as one of a line-up of presenters, we’re not paying any attention to the people who come before us. Most people are so focused on what they’ve got to say that they are effectively absent from the very room, in front of the very people that they want to connect with and have an impact on! We’re too busy worrying, ‘Is it me next? Oh no it is me!’ or ‘She’s stolen my idea!’ or ‘How much longer?’ So there’s something lovely about someone commenting genuinely and authentically on something that someone else has just said, and what it makes them think, as Sir Ken goes on to do. Sir Ken surely knows what he wants to say, and of course he will get there. But he is open to the moment, alive to the currents of the day, speaking with a strong sense of trust in the present moment. The more you trust that everything will be OK, the more you will be able to see, hear and experience what’s around you. The opposite is also true - if you start to close off through nerves, you won’t be able to see or hear so much because your brain is panicking about what you have to do, so you won’t hear noises in the building, pick up on cues from other speakers, hear comments from the audience. So be open. Trust. Say something that’s not about your talk. Say something that makes people feel proud of the conversation you’re about to share. Winning over an audience isn’t about crowd control or a tightly scripted gag, it’s about establishing a connection. And that comes from acknowledging the moment that you are all sharing - right then, right there. P.S. And if you’re feeling too nervous to do all that? Just pretend you’re OK, and see what happens.